This great mantra dedicated to Rudra as Mrityunjaya is found in the Rig Veda. 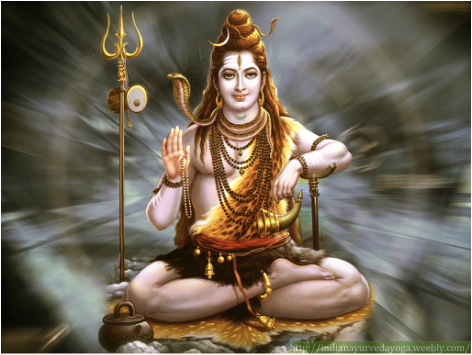 It is called the Maha Mrityunjaya mantra, the Great Death-Conquering mantra.It is called the Rudra mantra, referring to the furious aspect of Shiva; the Tryambakam mantra, alluding to Shiva's three eyes; and it is sometimes known as the Mrita-Sanjivini mantra because it is a component of the "life-restoring" practice given to the primordial sage Shukra after he had completed an exhausting period of austerity. We hail the fragrant Three-eyed One who nourishes [all] and increases the [sweet] fullness of life. As the cucumber is liberated from captivity [from its stem], may we [also] be liberated (mukshiya) from death (mrityor) not from immortality (maamritaat). urvārukam: 'urva' means "vishal" or big and powerful or deadly. 'arukam' means 'disease'. Thus urvārukam means deadly and overpowering diseases. (The pumpkin interpretation given in various places is also correct for the word urvārukam, but not apt for this mantra). The diseases are also of three kinds caused by the influence (in the negative) of the three guṇasand are ignorance (avidyā), falsehood (asat, as even though Vishnu is everywhere, we fail to perceive Him and are guided by our sight and other senses) and weaknesses (ṣaḍripu, a constraint of this physical body and Shiva is all powerful). bandhanān means bound down. Thus read with urvārukam iva, it means 'I am bound down just as by deadly and overpowering diseases'. According to some puranas ,the mahamrutyunjaya mantra has been used by many of rishis as well as Sati during the time when chandra(Moon) suffered from the curse of Prajapati Daksha. By the recitation of this mantra ,effect of curse of daksha that could make him die slowed and Shiva then taken chandrama on his head.